What Happened in The Santa Shop? I have heard Tim Greaton talk about his book titled, The Santa Shop on more than one occasion. Because of the respect I have for Greaton and because the story sounded intriguing, I decided to read this book which kept popping up all over the Internet. 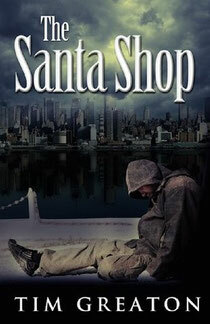 I began reading The Santa Shop and embarked on a journey into the mind of a man, Skip, who felt driven to commit suicide on Christmas Eve - which marked the one year anniversary of the deaths of his wife and son who had died in a house fire. It was easy to understand the feelings of inner guilt Skip had felt, however misplaced they may have been. However, the journey into discovery was amazing and the signposts along the way all pointed toward a loving God who was watching over every move Skip made. In fact, everywhere Skip traveled from the streets to the shelters and, ultimately, to Gray, Vermont, there were people who demonstrated unconditional love toward him despite his appearance and strong odor. The Santa Shop really drove home the point that, when someone is contemplating suicide, no one can force him/her not to take that step; it's something a person has to decide for him/herself because only then can it have a lasting impact. Of course, the story also shows that we can always hope for miracles, regardless of the types of lives we lived in the past - regardless of past mistakes or failures - and that tomorrow always brings a blessing into our lives if we decide to live long enough to discover this for ourselves. In so many ways, Tim Greaton's book, The Santa Shop, is very much like a parable in that it provides a timeless lesson - that God is willing to meet us when, and where, we need Him most. If you would like to learn more about this book and to read some of the reviews others have posted, click on the book cover. It will take you to The Santa Shop's page on Amazon.